This country’s hard earned freedom is at an undeniable risk due to the current government’s 100 day program, says Leader of the National Freedom Front (NFF) Wimal Weerawansa. In his Independence Day message he states that the current 100 day program agenda which has been adopted by the government will eventually pave the way to an obvious federal Sri Lanka and there is a necessity to unite on a national level to stand against it. According to NFF leader Weerawansa, the freedom of this country is on knife’s edge since the change of power in last January. “The Tamilnet website which belongs to the LTTE is currently active without any impediments. The Northern sector Governor G. A. Chandarasiri was removed from his post alongside the Tamil nationalist separatist’s plan and the newly appointed Prime Minister has promised to implement the 13th amendment after recognizing the independency of the Tamil community. Minister of Foreign Affairs Mangala Samaraweera has commented on the demilitarization of the North during his visit to India. Furthermore to make matters worse, Norway peace representative Erik Solheim, who as in favour of the separatist agendas, has reported delight over the government change,” said he. Some of us foresaw it, and encourage people to thing long and deep before casting votes. Whatever it is, they deserve since it is the C-H-O-I-C-E! 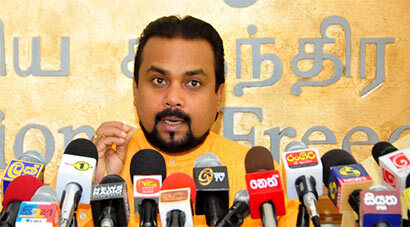 Mr Weerawansa is correct with the prospects facing our nation. The 100 day program appears to have fallen by the wayside. The Ministers, mainly UNP dinasaurs, are quiet and inactive. The cities are already neglented. There’s piles of garbage all over the place. The so-called Kudu Mudalali’s have not been cought by the law. Unfounded allegations of corruption are piling up in the Bribery Commission. The parliament’s majority decision regarding the former CJ has been overturned by the executive. The legally appointed CJ has been told he has no job. The influence of Tamil diaspora and LTTE rump are visible in key appointments. The US Asst Secretary was smiling broadly in glee during her visit. The British Foreign Minister also peeked to have a look at the new natives in office. Next to arrive will be the wWorld Bank and IMF who will take away the so-called relief provided to masses. Modi is destined to the North in the footsteps of Cameron. The Cameron visit lead to the ONHRC investigations on War crimes. Modi’s visit is likely to lead to a UN sponsored referendum on the right to self determination.